Bun drunk love. Too funny. Ahhh my fluffy white cloud. How I want to kiss that fuzzy face! better then fluff and fold! White fluff, that's the stuff! Such a face that bun has, such a face. Thanks for the photo tip, I'll give it a try. I love digital, it allows me to experiment without monetary punishment. The best pink nose on the web! 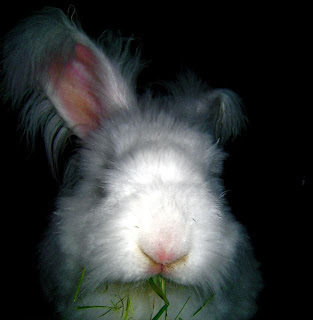 Fluffy white bunneh! I gotta get me one! I saw Lindsey Adelman's chandelier on CBS this morning...they almost missed it but got it in at the last minute. if you don't love these bunny photos and videos then i feel sorry for you! i shared this blog on facebook. love bunny running in circles a lot. U're surely both fluffed and stuffed!